BBC Journalists Have Been Told To Stop Saying "BBC Understands" Because It's "Slightly Pompous"
Yes, BuzzFeed News has also used the phrase “understands”. It can also leave readers a little perplexed. Like a guy named Angelo from Singapore who wondered aloud on Quora earlier this year. The ‘BBC understands’ refers to something BBC journalists have learned through their own endeavours. Not information in the public domain, not information gathered by our main news agencies (namely the Press Association, Reuters and Agence France Press) and typically news that we are reporting ahead of our competitors. And YES, I know, I know, I know, this is hardly the most pressing issue in global media at the moment. But people really notice it. It also happens to be a running joke among those in the British media. 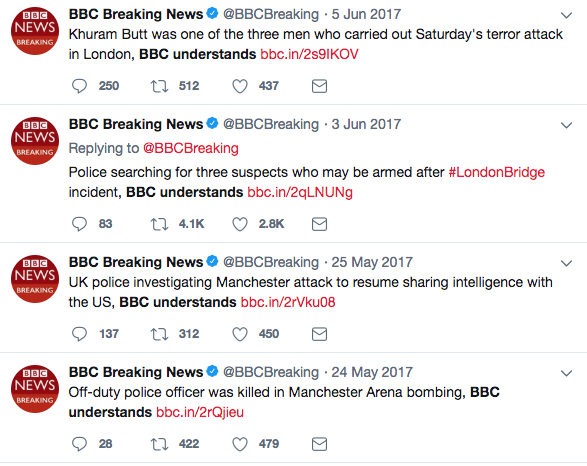 Journalists often accuse the corporation of using the phrase “BBC understands” in relation to stories reported by other outlets, which the BBC has then confirmed with its sources. In fact, last week I called out a BBC reporter for using the phrase in relation to a fact that had previously been reported by BuzzFeed News. 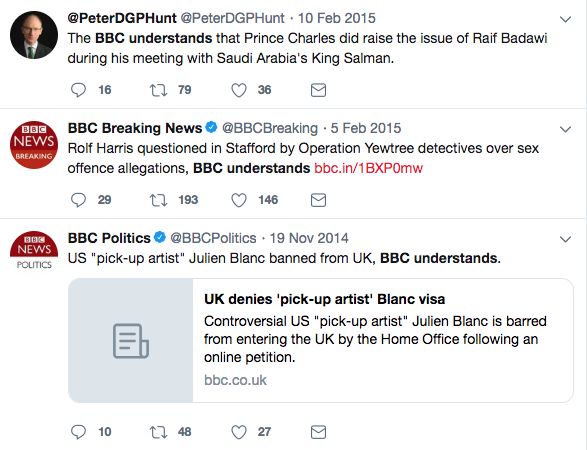 Obviously, we can’t confirm if this was the tweet that broke the camel’s back… but… BuzzFeed News understands a little over an hour later, BBC executive Gavin Allen emailed his management team telling them to stop using the phrase “BBC understands”. I can’t ever really see a reason to use this phrase: either it’s true and we know it in which case just report the story, or we’re unsure in which case don’t report it until we are. It’s also a slightly pompous distancing phrase as if the BBC is somehow different from us. The BBC wouldn’t comment any further on the policy change. But there you go! The BBC will no longer be ~understanding~ in their news stories. Now here’s a happy looking dog.